The professors of the Oral Learners Bible Institute are hard at work writing the lessons that will be translated and recorded into various languages. Lessons will be added to courses 15 lesson at a time. 15 lessons represent 1 credit unit. Text version of these lesson scripts are available for download and can be used as a resource for sermon preparation and discipleship training. 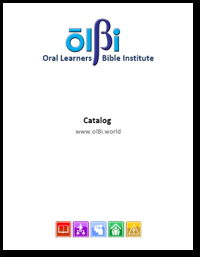 Please note that these lessons are copyrighted by the Oral Learners Initiative and cannot be reproduced or used in any way other than mentioned above without written permission. Click on the course numbers at right to be taken to the course page and list of pdf lessons. You will also find links to the lesson videos and the translated pdf scripts that have been recorded for each language.